To make this Papaya Salad, you’ll need green papaya. If you don’t have access to green papaya, you can substitute green mango or cucumber instead. This is a classic dish that many Thai people enjoy daily. It’s easy to find on street corners around Thailand. Using a mortar and pestle, smash and mix the chilies, long beans and garlic together until blended. Add the tomato, palm sugar, fish sauce or salt, a squeeze of lime juice, shredded papaya, carrot, tamarind sauce and shrimp paste to the mixture. Place the mix on a plate and sprinkle roasted peanuts on top as garnish. All course participants can take home a free print copy of our 40-page English recipe book. The all-new digital version of our cookbook, which features more detailed recipes and information, can be downloaded below. 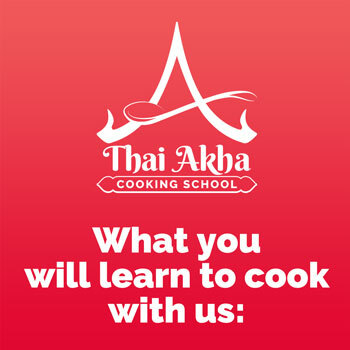 Book Now your Cooking Class with us!